Jakarta. 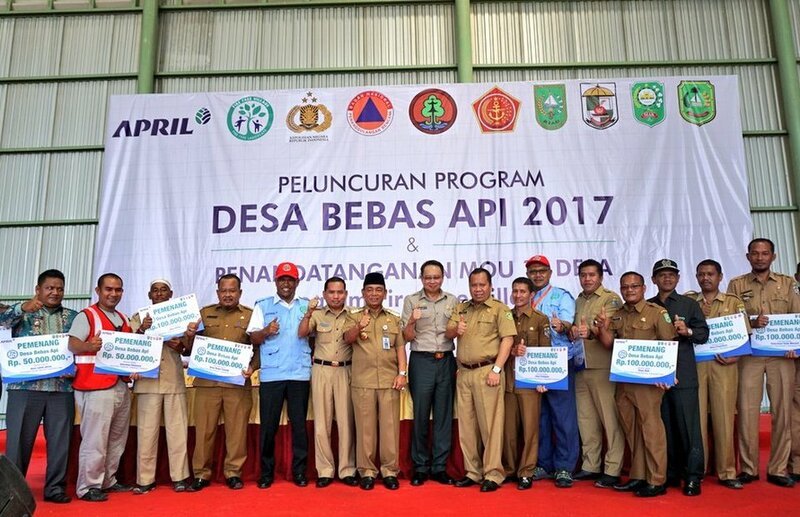 Riau Andalan Pulp and Paper, or RAPP, the operations unit of global pulp and paper industry leader Asia Pacific Resources International, launched its 2017 Fire-Free Village Program on Tuesday (16/05) to work with fire-prone villages during the upcoming dry season. In a statement released on Tuesday, RAPP said 18 villages throughout Riau province have joined the program in an effort to remain fire-free this year. Those villages include Langgam, Penarikan and Pangkalan Gondai, Dayun, Olak, Lubuk Jering, Tanjung Padang, Tasik Putri Puyu, Mekar Delima, Dedap, Kudap, Lukit, Bumi Asri, Pelantai, Teluk Belitung, Mayang Sari, Bagan Melibur and Mekar Sari. Willem Rampangilei, chief of the National Disaster Mitigation Agency (BNPB), said in the statement that the government appreciates all efforts – including those made by local governments – businesses and private citizens, to reduce land and forest fires. "We admire your preparation and appreciate that you have heeded the president's wishes to reduce forest fires," Willem said at the program's launch in Pelalawan, Riau, on Tuesday. The BNPB chief also thanked RAPP and congratulated villages that received awards for their success in preventing forest fires in the area. He said over the past three years, forest fires have declined significantly. Willem said the agency dispatched 26 helicopters to fight fires and three airplanes to patrol fire-prone areas across the archipelago last year. However, the BNPB chief stressed that early warning and fire monitoring systems, coupled with heightened public awareness, are crucial to combat forest fires. Willem said the rainy season is likely to last until the end of this month, and the ensuing dry season is not expected to let up until October or November. "The dry season is likely to last for five or six months, so we must be cautious," he said. Meanwhile, RAPP director Rudi Fajar said the program has helped increase public awareness about the dangers of fire in the vulnerable areas. This year, the program will be promoted at local schools to raise student awareness of the risks associated with open fire. So far, organizers have sponsored events at 50 schools across Riau, while a total of 72 are slated to participate by the end of the year. Started as a pilot program in 2014, the program was officially launched in 2015 with a total of nine villages taking part. Asia Pacific Resources International (April) will entrust village crew leaders to promote a no-burn policy in local communities to prevent forest and land fires. In 2015, many countries in the region and beyond called on Indonesia to more effectively manage its forest fire crisis after clouds of haze reached neighboring countries, including Singapore. The World Bank estimated economic losses related to that crisis to be $16 billion. Nine villages that participated in last year's Fire-Free Village Program were rewarded Rp 100 million ($7,500) for their efforts in preventing land fires. Those include Sering, Kuala Panduk, Petodaan, Teluk Binjai, Teluk Meranti, Penarikan, Olak, Tasik Putri Puyu and Tanjung Padang. Meanwhile, five villages received 50 million as forest fires in their respective locals measured no more than 2 hectares in area. Those recipients include Pelalawan, Kuala Tolam, Langgam, Pangkalan Gondai and Lubuk Jering. Four other villages who participated in last year's program didn't receive any cash rewards, as they failed to manage forest fires in their locales effectively.